Hunting for the perfect groomsmen gifts? Count on the leader in engraved pocket knives. 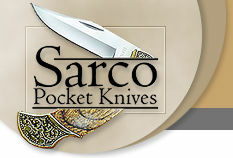 Sarco Pocket Knives has created a special item for just this occasion. Not merely another personalized pocket knife, this quality pocket knife features natural wood handles and beautiful embossed brass bolsters. The knife has a stainless steel “clip style” blade and is designed with a safely lock-back mechanism. Available exclusively through the sarcoknives.com website, this knife is equally desirable as a daily-use workhorse or as a sentimental collectible. With an actual size of 3” closed, it’s at home in your pocket or in a display case. The Sarco name is your assurance that these knives have been carefully crafted to satisfy not only this generation, but the next as well. We pledge our three and a half decades of cutlery experience that every customer will be 100% satisfied. Our newest featured item is a personalized knife with natural wood handle. Designed to Sarco’s demanding specifications, this beautiful blade is the perfect gift for a wedding and many other occasions. Groomsmen gifts, Christmas Gift... You'll make a lasting impression when you give this high quality engraved knife. 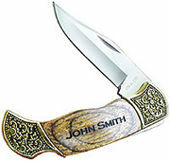 Beautiful embossed brass bolsters complement the natural wood handle on this quality pocket knife. The knife has a stainless steel 'clip style' blade and is designed with a safety lock-back mechanism.